This could so easily be one of those clickbait stories: ‘They wanted to design a new loudspeaker – and you won’t believe what happened next!’ You see, the latest model from British speaker company Neat Acoustics – so new it doesn’t even have a name yet – is a tiny floorstanding model just 45cm tall, based on the existing Iota, and capable of a huge, room-filling sound. 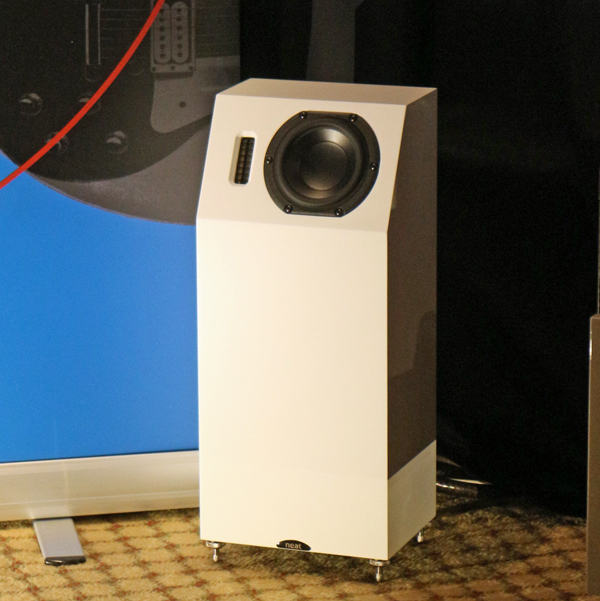 What’s more, the newcomer from the Barnard Castle factory seems to have created quite a stir at the Bristol Sound and Vision show – home to no shortage of silly-money speakers and systems – and not just for the ‘WTF?’ factor of walking into the room and seeing the two ultra-compact enclosures. Indeed, more than a few visitors were saying they thought it delivered the best sound at the event. It’s still a work in progress, but when you can get the irrepressible Bob Surgeoner of Neat away from talking guitars and classic recordings – he’s an avid collector and player of both, with encyclopaedic knowledge – a few more details are forthcoming. Set for an official launch at the Munich High End 2016 show in May, and in the shops soon after that, the new speaker uses the same drivers as Iota – a 50mm ribbon tweeter and 10cm mid/bass driver – in a sealed enclosure with an upward tilt, while the extra cabinetry houses a downward-firing 13.5cm bass unit with port-tuning. It’s set to sell for around £1250-£1300 a pair when it does go on sale, and is likely to be in a rather more conservative range of colours than Iota – think white and possibly black, and you’ll be on pretty safe ground. 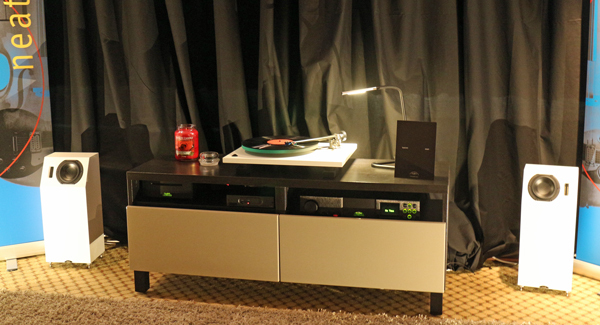 Playing on the end of a Naim SuperUniti, with a UnitiServe storing the music, the little speakers were originally intended to be even smaller, looking like miniature stage monitors, but along the way have gained a bit of extra height. But they’re not exactly huge, as you can see from this picture of the pair alongside the company’s demonstration set-up. The other vital stats, by the way, are just 20cm wide by 16cm deep. And that up-tilted design certainly works: even in one of the notoriously nasty-sounding hotel rooms used for the show, the Neats managed to cast a sonic picture well above the speakers themselves, and with excellent imaging as well as fine punch and timing. And serious bass. I’m a big fan of the original Iotas, and have a pair sitting on foam studio monitor wedges here on my desk as I write this, powered by an original NaimUniti; it’s been my desktop system for a couple of years now, so I’m very familiar with what it can do. The new Neats – whatever they end up being called – have to promise of being able to bring the Iota sound to more conventional room set-ups, and I’m looking forward to hearing them here at home as soon as possible. And when I do, I’ll make sure you’re the first to know just how these unusually attractive mini-floorstanders perform. They were great, weren’t they? I thought at first there was not another bass unit, but was put straight on that! They ought to have a competition for the name. I gather they want to avoid it sounding like Iota for fear of confusion in ordering – sensible I guess. The other affordable surprises were the Elac Debut @£250 and the new Mission LX at £200, both of which put many bigger systems to shame. That’s a relief; I was beginning to doubt myself! Very interesting product and write-up Andrew, thank you. Like you I’ve been a fan of the original Iotas since hearing them at Bristol’s show a few years ago. I remember staying in Neat’s room longer than any others, just enjoying them making music. As for the name, my suggestion is Neat Napolean. Small, big impact. Might not be received too well in some export markets though. I look forward to further news and reviews of it with interest. Names? Maybe they should be called the Kappa, as they’re one beyond the Iota; or the Sigma, as they sound like they may be twice as good as the Iota. But then, given they’re a lifted-up Iota, perhaps Upsilon would do the trick? I am wondering why Bob is pushing so hard Neat / Naim combo. Neat speakers sing much, much better paired with Exposure amps IMO. I thought they sounded smooth, detailed and sweet, and friends who heard them rocking out were equally impressed. Definitely want to hear these again when they hit the shops, as I’m questing for new speakers and these may well be the ones. Is it fair to describe these speakers as small stand mounts with built in subs? If so, that’s genius. Their looks remind me of a kitchen bin. Now that’s going to be a dilemma for me. I already have the Motive SX2’s and I love them. I wonder if the new Neats have the bass response or the overall depth of the SX2’s. I’m very curious to find out once they hit Canada. Regarding your current desktop system using the IOTA speakers, I’m contemplating the same but am a bit concerned that they only show their best when played loud, which won’t necessarily be the case on my desktop. Do you find them OK at lower levels in such a “near field” situation? Short and simple answer: yes, absolutely. ← The end of 3D TVs? What took them so long?